Our contributor bought a spear, or pike, from an antique shop in Chagrin Falls, Ohio. 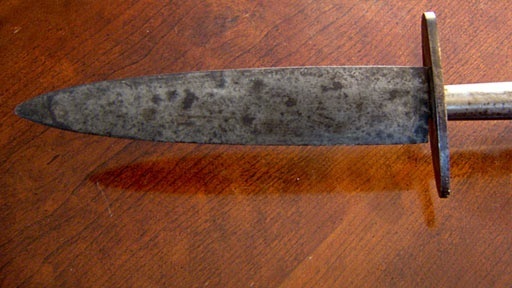 He knows abolitionist John Brown lived near Chagrin Falls and wonders if rebels used this blade in John Brown’s famous raid at Harpers Ferry, VA. In October 16, 1859, John Brown and 18 men attacked the federal armory in Harpers Ferry. Brown wanted to secure weapons for a future slave rebellion. Instead, thirteen raiders were killed; John Brown was captured and hanged. To find out whether rebels used this pike in that raid, History Detectives follows the trail to the blacksmith who forged the weapon over 150 years ago, and walks the ground at Harpers Ferry where the battle took place. Related Investigation Little Bighorn Bayonet Could this bayonet have been used at one of the largest massacres of U.S. soldiers by American Indians? Also in Season 9 Kittery Telescope What can this telescope reveal about America’s earliest struggles for independence? Related Investigation Pete Gray Cartoon Do these unsigned drawings from the golden age of comics tell the tale of a real life superhero? Also in Season 9 Tiffany Window What can this watercolor reveal about the unexpected world of one of America’s great artists? Also with Wes Cowan U.S.S Indianapolis Are these WWII souvenirs remnants from one of Japan’s famous kamikaze attacks? Also in Civil War: 1850-1877 Chandler Tintype How did this Civil War era tintype help re-ignite a fiery debate about African Americans bearing arms for the confederacy?